Among the younger contemporaries of Rāmānuja Āchārya there was Parāśara Bhaṭṭa, son of Kureśa, as a learned scholar and author. Born about 1071 A.D., Parāśara had an exceedingly bright scholastic career, and was duly initiated in the sacred lore, by Rāmānuja's cousin and pupil, Govinda. In one of these, it is said, he sought out an eminent scholar of the Western country or the modern Mysore, who was a reputed Advaitin and was, in fact, known by the name of Vedanti. It would seem that Vedanti was a rich man and usually fed hundreds of Brahmins every day. Parāśara went in amongst the crowd dressed like a common man; but on reaching the inside of the house where the feast was held, approached Vedanti who was present there, and asked him to grant him the alms of disputation. The scholar could not resist and so commenced, we are told, a controversy, for ten days, in which Parāśara became the victor. He then converted Vedanti to his faith, and the latter became an important disciple. Some years after, Vedanti deserted his native country, and going to Śrīraṅgam with all that remained of his wealth, bestowed it on Parāśara, and became a sannyāsin under the name of Nañjiyar, meaning - “our sannyāsin”, bestowed upon him by Parāśara. The family of the Bhaṭṭar’s is well-known for its Sanskrit scholarship and copious contribution to the religious and philosophical literature of the day. Kureśa, the founder, has himself composed five stotras, on the Deities of various shrines, which are well-known for their erudition and power of expression. Two of these the Vaikuṇṭha Stava and the Atimanusha Stava, are especially very readable And are justly favourites with Vaiṣṇavite scholars. Parāśara Bhaṭṭa has also contributed two hymns to the stotra literature, one on Goddess Lakshmi, who is a personality with the Vaishnavas, second only to Nārāyaṇa himself, and the other on the God of Śrīraṅgam, whom Parāśara looked upon almost as his father in flesh and blood. The poems are, however, rugged and not easily understandable, but the former of the hymns, the Śrīguṇa Ratna Kośa, contains several stanzas of good poetry in sublime language. Among other works of this writer may be mentioned the Tattva-ratna-kāra on philosophy, now practically extinct but largely quoted from by Śrī Vedanta Deśika, and the commentary on the Vishnu Sahasranāma, already mentioned. Nañjiyar also composed some works, in Tamil it is to be presumed, one of which seems to have been named the Tattva-dīpana. so-called as the quantity of syllables in the work is computed to be Nine-thousand Granthas, a Grantha being equivalent to 32 syllables or no Anuṣṭubh verse. It has become usual to Adopt this mode of computation in Sanskrit and Tamil works even when they are in prose, on the analogy of the Mahābhārata, the Rāmāyaṇa, and the Purāṇas whose Grantha computations are carefully preserved in the Colophons. It is now proper to mention that, during this period, the study of the Tiruvāymoḷi of Śrī Caṭakōpaṉ received considerable attention from the Vaishnava scholars of the day. Specialisation was adopted and while one set of scholars continued to expound and comment upon the Śrī Bhāshya and the allied Sanskrit works, another set took to the study of the Tamil works of the Āḻvārs, which gave them full employment. and being couched in language which is often ancient and abstruse, lent themselves to ample comments; and the Vaishnava scholars, many of whom were good in Sanskrit as well, lost no time in writing learned commentaries on the different portions of them. Nañjiyar was succeeded by a disciple Kalivairi or Nampiḷḷai, who taught the Tamil hymns largely and composed a commentary on a small portion out of them. A disciple of Nampiḷḷai, Vaṭakku-Tiru-Vedī- Piḷḷai by name, is the author of an extensive commentary known as the Thirty-six-Thousand. This work is an inexhaustible storehouse of traditions on the different interpretations of the text and gives us a good idea of the amount of industry and learning that was accomplished on the study of these Tamil works. Periyavāccāṉ Piḷḷai was another of Nampiḷḷai’s pupils who wrote full commentaries on the Tiruvāymoḷi and the other hymns as well and was a most prolific and well-informed writer of the day. and the writers of the Northern School, generally known as the Vaḍakalai, who, though more largely patronising Sanskrit works, had still an equal regard for the Tamil hymns and expounded them in their lectures. Vedanta Deśika himself, as representing the latter class, was, as we have seen an able Tamil scholar and author and is said to have composed a commentary on the Tiruvāymoḷi, which is not now extant. But various authors after his date have written such commentaries and at least 5 exist now, which are studied by various traditions of the orthodox Vaḍakalai class. These works are in terse and elliptic style and were evidently meant as summaries in pithy language of doctrines which were expounded orally at great length. Piḷḷai Lokāchārya was an elderly contemporary of Śrī Vedanta Deśika; and the latter, in his works, especially, the Rāhasyatraya Sāra, alludes in various places to his views and purports to controvert them. The Tattva Traya is an exposition of the principles of the Viśiṣṭādvaita philosophy and its view of the development of the universe and the inter-relationship of the souls and God. The other work, the Vāchana Bhūṣaṇa, is held in extraordinary veneration by the followers of this school, as a repository of secret and esoteric doctrines, incapable of being understood except under the direct teaching of a duly qualified preceptor. the emphasis given to the doctrine of Grace by the assertion that even the sins of men are agreeable to God, and the somewhat unceremonious rejection of caste-superiority as a ground for respect among men otherwise equally venerable as lovers of God. It will be perceived that the last is a feature which must ensure the adherence of non-Brahmin Vaiṣṇavites generally, who form a majority among those of the Southern School. The excessive adoration of the Guru, as yet theoretical in Southern India, has become, as we shall see, a permanent feature of Northern Vaishnavism as developed by Rāmānanda and his followers, who also, from the necessities of their position, threw all caste distinctions to the winds, and drew followers from every class and creed. The next writer of note in this school of Vaishnavas was the well-known Maṇavāḷa Mamunigal, whose name has been appropriated for the heading of this article. He was born near Āḻvār-Tirunāgari about 1370 A. D., and is said to have lived for 73 years, up to 1443 A. D.
Of well-built proportions and extremely fair, almost white, in appearance, he soon attracted attention by his intelligence and ability and came to be recognised as an eminent scholar. 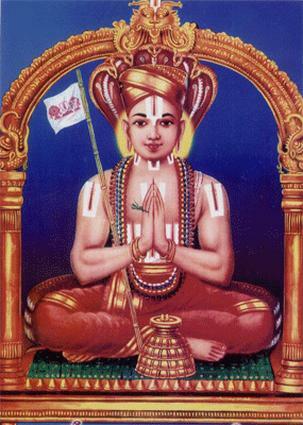 He was a pupil of one Śrī Sailesa or Tiruvāymoḷi Pillai, a teacher of the Tamil hymns, as the name implies. Maṇavāḷa Mamunigal spent his early years at Tirunāgari and then moved to Śrīraṅgam, the holy city of so many eminent divines. Here he permanently established himself and acquired a large following of pupils and admirers. the acquiring of control over temple management and ritual in various places, and the repair of shrines in various districts out of funds collected from the richer of his followers or paid voluntarily by devotees. He possesses the great merit, found in few other Hindu writers of giving references to the quotations spread throughout important Tamil works like the Thirty-six Thousands commentary, and always quotes the sources of the texts that he himself extracts. One of them is the Yatirāja Vimsathi or twenty verses in Sanskrit in praise of Śrī Rāmānuja, and is in simple style. We find here the curious introduction of initial rhyme in many of the stanzas; that is to say, the second syllables of the four lines of each verse are identical, a feature universal in Tamil prosody but unknown to Sanskrit readers; though final rhyme, as in English poetry, is occasionally met with in Sanskrit. The former is a list of the names of Āḻvārs and chief teachers with some account of their works. The latter is a passionate appeal to Śrī Rāmānuja in heaven, to end his days and liberate him from the physical ills which seem to have worried him late in life, and the torment of worldly existence which every Hindu is expected to detest. Maṇavāḷa Mamunigal had a son Rāmānuja who seems to have died before him and a grandson Jīyar Nayinar, who survived him. the other a vigorous laudatory poem of 70 verses on Śrī Vedanta Deśika. We have clear indications in this later work of the growing dissensions between the adherents of the two schools. The author of the 70 verses asserts his indebtedness to the teachings of Vedanta Deśika and his son Varadāchārya (1317 to 1414 A. D.), and states that he is a pupil of the latter. It is understood however that he later became an adherent of Maṇavāḷa Mamunigal. are known by the name of Aṣṭa Diggajas or the eight elephants, guarding the eight quarters in evident allusion to the strong support which they gave to their chief in the promulgation of his doctrines. is the claim of either tradition to officiate exclusively in the temple rituals and worship, to the accompaniment of certain recitations commencing with what has come to be known as the patrams. The recitation of the Tamil songs of the Āḻvārs has been connected with temple ritual from the time of Rāmānuja, and possibly from earlier times also. The patram (dedication) is however, for each community, a single stanza in Anuṣṭubh-metre, which sets forth the name of its leading Teacher, and is peculiar to him. I worship Vedanta Deśikan (Āchārya or preceptor uniquely praised as such due to his great contribution and strict adherence to Vedāntic tradition), named Veṅkaṭanātha, endowed with auspiciousness and glories, who was a receptacle of the mercy (dayā) of his Āchārya Śrī Rāmānuja, and who was adorned with the jewels of wisdom (jñāna) and dispassion (Vairāgya). I salute Śrī Maṇavāḷa Mamunigal, who has the blessings of Tiruvāymoḷi Piḷḷai (Maṇavāḷa Mamunigal’s Āchārya- Śrī Sailēsa) and who is an ocean of jñāna (knowledge) and Bhakti (devotion). but of course the right of commencement is fought out eagerly, as it is the prelude to the exercise of other rights in the temple and neither party is willing to use or listen to the recital of the other's verse, as it may imply an allegiance which it stoutly refuses to grant. The English educated community of both traditions and those among the others who have no chances of participating in temple emoluments have no relish for such unseemly disputes, and regard them as deplorable. It is to be hoped that, as education increases and the spirit of national life develops, the two traditions may learn greater toleration and manage to live in peace, studying the works of their teachers, instead of getting them up parrot-like, and engaging in free-fights on such trivial matters as the dedications.